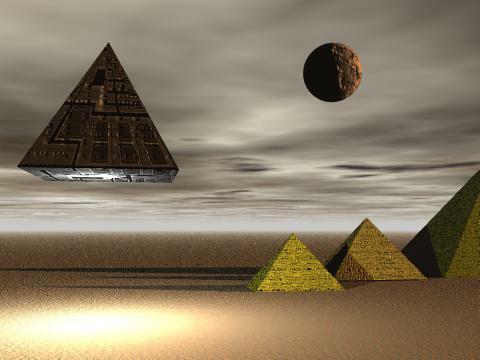 WELCOME TO MY PAGE OF ANCIENT MYSTERIES,COME WITH ME ON A FASCINATING JOURNEY OF THE UNEXPLAINED! EVER SINCE I CAN REMEMBER I HAVE BEEN INTRIGUED BY THE UNEXPLAINED MYSTERIES OF OUR PLANET... THE THEORIES PUT FORWARD, THE SPECULATION BUT NEVER, NEVER A SATISFACTORY ANSWER TO THE MYSTERIES LEFT BY THE ANCIENTS, OR WHOM... OR WHAT...? I WILL PRESENT YOU WITH SOME INTERESTING SITES TO MAKE THAT GREY MATTER WORK. YOU MAKE UP YOUR OWN MIND, THIS IS THE FREEDOM OF HOMO SAPIEN, ONCE WE GET PAST CENTURIES OF MIND CONTROL AND CONDITIONING.. THINK FOR YOURSELF! HAVE YOU EVER THOUGHT THAT IF TERRA FIRMA WAS UNITED AS ONE PEOPLES AND PLANET, WE WOULD BE A FORCE TO BE RECKONED WITH IN THE GALATIC EMPIRE.FINANCE SQUANDERED ON WARS AND UNTOLD HUMAN MISERY AND SUFFERING WOULD HAVE BEEN PUT TO A FAR MORE INTELLIGENT PURPOSE, OF BUILDING A STRONG UNITED EARTH, WE WOULD HAVE REACHED MARS LONG AGO, COLONIZED THAT PLANET AND MOVED ON.IT MAKES ONE WONDER AS TO WHOSE ADVANTAGE HAS IT BEEN TO KEEP HOMO SAPIEN, A SAVAGE BICKERING RACE, LIKE A VIRUS SPREADING AND HELL BENT ON DESTROYING, ITSELF AND HABITAT- SUCH A SENSELESS NO WIN SITUATION, AND EXERCISE IN SHEER STUPIDITY AS SHOWN MOST Graphically BY OUR PAST HISTORY-SUCH A WASTE OF HUMAN ENDEAVOUR WHEN WE HAVE THE WHOLE UNIVERSE AS OUR HERITAGE! IN THE EARLY 1900'S WORKERS ON A HOUSING DEVELOPMENT PROJECT, WEST OF JODPHUR, INDIA, DISCOVERED THE RUINS OF AN ANCIENT CITY BURIED IN A MANTLE OF RADIO-ACTIVE DUST. THE ARCHEAOLOGISTS ESTIMATE THE SIZE OF THE CITY TO EXCEED OVER HALF A MILLIONS SOULS.INVESTIGATORS BELIEVE THE CITY, 8,000 TO 12,OOO OLD TO HAVE BEEN DESTROYED BY NUCLEAR BOMBS, THE SIZE OF THE ONES THAT ANNIHILATED NGASAKI AND HIROSHIMA, JAPAN IN 1945...BEFORE YOU SCOFF AND SAY IMPOSSIBLE READ THE MAHABHARATA..THESE VERY ANCIENT SCRIPTS EVEN SPEAK OF FLYING MACHINES "THE VIMANAS"..BC.INTRUIGING! HUMANITIES GREATEST WEAKNESS IS "FEAR",THROUGH THIS ONE EMOTION, MAN CAN BE CONTROLLED AND MANIPULATED INTO BEHAVOURAL PATTERNS OF HATE, BIGOTRY, WARS, AND MASSIVE GLOBAL DESTRUCTION-THINK ABOUT IT-WE ARE THE PUPPETS-BUT WHO OR WHAT IS THE PUPPETEER? MIND CONTROL: IS THE MOST TOTAL ENCOMPASSING EVIL ON TERRA FIRMA. AN INSIDIOUS CONTROLLING MIASMA OF DARKNESS ENSLAVING MINDS AND SOULS INTO CENTURIES OF HATRED, WARS, AND SHEER STUPIDITY! MIND CONTROL SETS HUMAN BEHAVIOUR INTO A RIGID PATTERN, A MENTAL STRAIGHTJACKET OF INTOLERANCE, BIGOTRY, OF DEATH AND DESTRUCTION! ONE ONLY HAS TO LOOK AT THE FRUITS OF MIND CONTROL ON OUR PLANET TODAY- NOT MUCH TO BE PROUD OF. DESTRUCTION OF WILDLIFE, DESTRUCTION OF SEA LIFE, DESTRUCTION OF PLANT LIFE, DESTRUCTION OF " LIFE" NOT A PRETTY RECORD IS IT?- AND WHY? ONE MUST ASK? FROM AN OBSERVATION FROM OUT OF SPACE, THIS PLANET MUST SEEM AS A MAD HOUSE, IN IT'S TERRIFYING DEADLY PURSUIT OF SELF DESTRUCTION...........HAVE YOU EVER WONDERED, .MAYBE THERE HAS NEVER BEEN 'ALIENS AS SUCH, PERHAPS MAN WAS THE SUPER-HUMAN OF OLD, WE LIVED TO 1000YRS, WE HAD SECOND SIGHT, AND OTHER SUPER-HUMAN POWERS, PERHAPS WE SUPER- HUMANS BUILT ALL THE WONDERS WE CANNOT EXPLAIN OR DUPLICATE TODAY, IE GIZEH PYRAMID, INDIAS RUSTLESS IRON, TO NAME A FEW, I NEVER KNEW THE MYTH OF RAMA BUILDING A BRIDGE BETWEEN INDIA&? , & REMAINS OF ANCIENT NUCLEAR WARS, WERE ACTUAL FACTS AS PROVEN BY SATILITE PHOTOS, HOW MANY MORE SO CALLED MYTHS ARE IN FACT TRUTH? TO WHOM WERE WE A SUCH A THREAT AS TO BE DEMOTED, DNA ALTERED AND ENSLAVED IN MIND CONTROL FOR CENTURIES? HMMMMMM MAKES YOU WONDER? MYSTERY OF BAALBECK, THE LARGEST CUT STONES ON THE PLANET HOW DID THEY DO IT?. THE MARS EARTH - MYSTERIES. SO WHY IS HOMO SAPIEN SO INTELLIGENT YET SO SERIOUSLY FLAWED? HUMANITY APPEARS TO HAVE A STUMBLING BLOCK ( GENETIC INTERFERENCE? ) WHICH STOPS US SHORT OF PULLING TOGETHER AS A PLANET TO ACHIEVE GREATNESS WITH A CAPITAL "G" ! HERE THE PLOT COMES FULL CIRCLE WITH THE LAYING DOWN OF GENERATIONS OF MIND PATTERNS " MIND CONTROL" . WE ONLY USE A TENTH OF OUR BRAIN POWER - WHY? WE ARE REALLY SUPER HUMANS, KEPT AT A LEVEL OF BEASTIALITY THROUGH IGNORANCE, FALSE BELIEF PATTERNS ,AND DOCTRINES, WHY?. TO WHOM ARE WE A THREAT IF WE ACHIEVED OUR RIGHTFUL PLACE IN THE UNIVERSE? WHO REALLY WAS THIS CHARACTER "JEHOVAH" IN JEWISH HISTORY? THE OLD TESTAMENT,( JEWISH HISTORY) READS AS A HORROR MANUAL, WHOLESALE SLAUGHTER, AND DESTRUCTION, WOE BETIDE THE POOR WRETCHES THAT DARE GO AGAINST THE "DICTATOR" OF THOSE DAYS. AND IT'S CALLED RELIGON , ONE "MESSENGER' SLEW 24,000 SOULS, TACTICAL CONTROL OF THE MASSES. AND THE 'MESSENGERS ' (ANGELS), NO WINGS THEN! THE "MESSENGERS" WERE AS US, EATING AND DRINKING, POSSIBLY GROUND TROOPS FROM THE THEN SPACE SHIPS, IE "EZIEKEL", GLORIFIED INTO SUPER BEINGS, AGAIN FOR CONTROL OF THE MASSES BE INFORMED. OPEN YOUR MIND AND THINK FREELY FROM CONTROL AND MAN MADE DOGMAS! PURE SPIRITUALITY IS SUBLINE. MAN MADE PERVERTED RELIGON IS PURE EVIL. LOOK AT WORLD HISTORY AND THE ROLE OF RELIGON, NOT A PRETTY RECORD, BILLIONS AND BILLIONS OF TERRIBLE DEATHS IN THE NAME OF A "GOD" , WHAT GOD AND WHOSE GOD? WE PREACH LOVE WITH MEALY MOUTHS THEN GO AND KILL EACH OTHER, WE DEVISE HORRIFC WAYS TO DESTROY OURSELVES, OUR BROTHERS AND OUR PLANET, HARDLY SPIRITUAL , MOST DEFINETELY NOT HOLY! ! SINCE THE BIRTH OF THE TWO MAIN RELIGONS, WOMEN HAVE BEEN DOWNGRADED TO THE LEVEL OF BEASTS. ACTUALLY A BEAST IS USUALLY WORTH MORE!. WHY? THIS INTRUIGES ME THAT THERE IS SOMETHING ABOUT WOMEN , SO POWERFUL AS TO BE A THREAT TO WHOM? SO THREATENING THAT MAINLINE RELIGONS SEEKS THEIR DEMISE. NOW JESUS WAS A DIFFERENT KETTLE OF FISH, IF YOU READ IT RIGHT,LET HIM WHO HAS EARS ETC., HE CAME WITH A SWORD TO BREAK UP THE THE FALSE PERVERTED DOCTRINES AND MONOPOLY OF FALSE PRIESTS AND TEACHERS AND THE LIKE! NO WIMP WAS HE, DIDN'T LIKE THAT DID THEY, SO THEY HAD TO GET RID OF THAT TROUBLEMAKER, JESUS AND OTHERS HAVE TRIED TO HELP THE WORLD, BUT WHO LISTENED? HIS WORDS HAVE BEEN CORRUPTED AND USED FOR CONTROL, SO ONCE AGAIN THE WHEEL TURNS, AND MOST OF HUMANITY LIVE IN MIND AND THOUGHT ENSLAVEMENT.LOOK AT WHAT IS HAPPENING RIGHT A THIS MOMENT AROUND THE WORLD, CREATURE MAN THE DEMON MADE YOU FOR HIS OWN, AND THUS MOSTLY IN THE NAME OF RELIGON, DEGRADATION OF THE MOST LOATHSOME KIND IN ALL HUMAN VALUES ..SHAME FOR THE HUMAN RACE........THINK FOR YOURSELF, TAKE THE FIRST STEP AND BE FREE IN YOUR MIND. THERE ARE NO BOUNDARIES EXCEPT WHAT YOU YOURSELF IMPOSE ON YOURSELF! DON'T LET SOMEONE THINK FOR YOU! THE MYSTERY OF ANCIENT STONE TECH? EXPLORE ANCIENT RUINS WITH TEAM ATLANTIS! 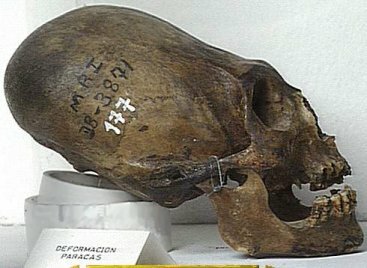 Quite a few similar skulls have been found in PERU and a great many GIANTS skeletal remains have also been found, in many parts of the World, attesting to the fact of races of rather larger than life people once existing here on terra firma, so why the secrecy?Who messed around with our dna ? are we hu-man hybrids?who tried to wipe us out and why? In SOUTH AMERICA as with many other parts of the ANCIENT WORLD there are ominous signs of many ANCIENT CIVILIZATIONS being destroyed and obliterated by such massive force, that melted and vitrified the stone construction of the cities, massive fortresses, deserts. Just who were these so called GODS who reigned terror and death down on our helpless forebears? and why, were we human/hybrids getting to smart? Just who/what benefits from Mans ignorance through lack of access to knowledge? That's the million dollar question folks..knowledge is freedom. At the left is pic of one of the very odd elongated skulls found all over the world,read what is said about these skulls and make up your own mind, also skeletal remains have been found of 'GAINTS ' you now the big guys referred to in the Bible.these mighty bones have been found in many places on earth including the USA......so there is quite a few weird things going down on Planet earth, that many are not aware of as it is not always publicized, but there is no excuse for ignorance today as in formation is readily available online, all you need is wisdom and discrimination and with a clear unfettered mind, free of man made dogmas, to make up YOUR OWN MIND as to you think is right.. THIS IS A NEW ZEALAND SITE.